This one affirmative statement changed her perspective on her life and she repeated this affirmation to herself countless times until she actually completely healed herself, her body, mind and spirit. 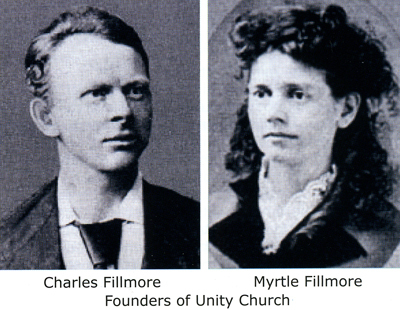 A few years later, Myrtle Fillmore wrote one of the most popular articles that have ever appeared in Unity magazine –the story of her healing. I have made what seems to me a discovery. I was fearfully sick; I had all the ills of mind and body that I could bear. Medicine and doctors ceased to give me relief, and I was in despair when I found practical Christianity. I took it up and I was healed. I did most of the healing myself, because I wanted the understanding for future use. This is how I made what I call my discovery. I was thinking about life. Life is everywhere –in worm and in man. “Then why does not the life in the worm make a body like man’s?” I asked. Then I thought, “The worm has not as much sense as man.” Ah! intelligence, as well as life, is needed to make a body. Here is the key to my discovery. Life has to be guided by intelligence in making all forms. The same law works in my own body. Life is simply a form of energy, and has to be guided and directed in man’s body by his intelligence. How do we communicate intelligence? By thinking and talking, of course. Then it flashed upon me that I might talk to the life in every part of my body and have it do just what I wanted. I began to teach my body and got marvelous results. I told the life in my liver that it was not torpid or inert, but full of vigor and energy. I told the life in my stomach that it was not weak or inefficient, but energetic, strong, and intelligent. I told the life in my abdomen that it was no longer infested with ignorant thoughts or disease, put there by myself and by doctors, but that it was all athrill with the sweet, pure, wholesome energy of God. I told my limbs that they were active and strong. I told my eyes that they did not see of themselves but that they expressed the sight of Spirit, and that they were drawing on an unlimited source. I told them that they were young eyes, clear, bright eyes, because the light of God shone right through them. I told my heart that the pure love of Jesus Christ flowed in and out through its beatings and that all the world felt its joyous pulsation. I went to all the life centers in my body and spoke words of Truth to them –words of strength and power. I asked their forgiveness for the foolish, ignorant course that I had pursued in the past, when I had condemned them and called them weak, inefficient, and diseased. I did not become discouraged at their being slow to wake up, but kept right on, both silently and aloud, declaring the words of Truth, until the organs responded. And neither did I forget to tell them that they were free, unlimited Spirit. I told them that they were not corruptible flesh, but centers of life and energy omnipresent. Then I asked the Father to forgive me for taking His life into my organism and there using it so meanly. I promised Him that I would never, never again retard the free flow of that life through my mind and my body by any false word or thought; that I would always bless it and encourage it with true thoughts and words in its wise work of building up my body temple; that I would use all diligence and wisdom in telling it just what I wanted it to do. I also saw that I was using the life of the Father in thinking thoughts and speaking words, and I became very watchful as to what I thought and said. I did not let any worried or anxious thoughts into my mind and I stopped speaking gossipy, frivolous, petulant, angry words. I let a little prayer go up every hour that Jesus Christ would be with me and help me to think and speak only kind, loving, true words. I am sure that He is with me because I am so peaceful and happy now. . . I want everybody to know about this beautiful, true law, and to use it. It is not a new discovery, but when you use it and get the fruits of health and harmony, it will seem new to you, and you will feel that it is your own discovery. In two years, Myrtle Fillmore was no longer sick or invalid. Through her prayers she was made completely whole. After her own healing, many people came to know about it. Her neighbors who had known her as sick saw the change and were curious about how this miracle had taken place. People began to come to her for help. Charles and Myrtle lived in a house on Wabash Avenue in Kansas City. One of the first people to come to her was an Irishman named Caskey who lived across the street. He was crippled and had to walk on crutches. It took him quite some time to finally comprehend the idea she was trying to convey to him. He didn’t believe it was possible that he could be healed. The two of them would discuss ideas and pray together; and then she would prompt him to put down his crutches and walk. He would say, “How do I know I can walk?” But again and again she would give him affirmative statements of prayer and have him repeat them with her. No matter how much he questioned and doubted, she knew that he could walk. One day, when she told him to put down his crutches and walk, that is exactly what he did. He laid his crutches down and walked across the room. The crippled condition completely disappeared. Years later, Lowell Fillmore (son of Charles and Myrtle) was walking down a street when an express wagon drove up beside him and the driver jumped down from the seat. 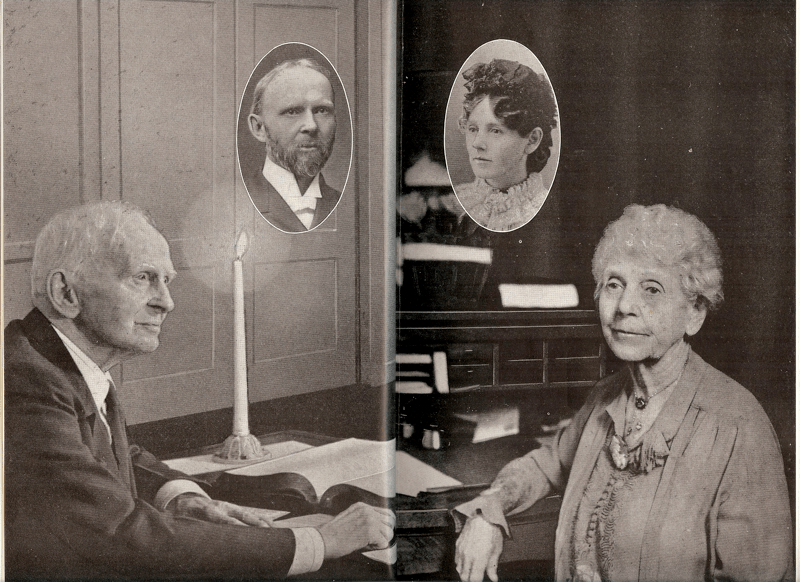 “Aren’t you Lowell Fillmore?” the man inquired, and he went on to say that he was Mr. Caskey, whom his mother had prayed with many years before. Many others began to hear about this woman on Wabash Avenue whose prayers were able to bring about healing. The Fillmore’s laundress had asthma. To her, too, Myrtle suggested prayer, and in a short time she was whole again. One day a salesman came to the door. He was selling picture frames and molding. He had a suitcase filled with samples of frames to show. Myrtle was the kind of person who never turned people away. In a few moments, he was inside the house with all his samples spread out on the floor. Her son Lowell was there, and he crowded forward to see what the salesman had. “This is my little boy,” said Mrs. Fillmore to the salesman. “Well,” said the salesman, “my little boy will never see again.” This, of course, she immediately and vigorously denied. She told him of her own experience with prayer, and after a while he asked her if she would come to see his son who had advanced cataracts on both of his eyes. When she first saw the boy, Myrtle Fillmore said his eyes looked as though they were covered with something like the white of an egg, but she was not dismayed by the others, helping him to realize that he was the beloved child of God, that God loved him, that God’s will for him was perfect sight. The second time she went to see him, he had improved so much that he could come to the door and let her in. In a short time his eyes were completely healed. Her fame spread beyond her own neighborhood. People from other parts of Kansas City and even from nearby towns started coming to ask for help. To all of them, she gave the same response: that they were God’s beloved children and His will for them was health, that the healing power of the Christ was in them and they too could have perfect wholeness by realizing this Truth. In the meantime, her husband Charles Fillmore had come but slowly to accept what to his wife had been an instant and overwhelming revelation. Eventually he did come to fully embrace this new way of thinking and they both went on to the Founding of Unity.